In this article, I will show you how to easily find IP Address of your Windows Computer. Our Windows PC consist of 2 IP addresses one is Public IP and the other one is Private IP address. An Internet Protocol address (IP address) is an address assigned to each device connected to a computer network. IP address provides an identity for your device on a network computer. If the computer is connected to a network as well as to the internet, then the computer will have a Private IP address and a public IP address. An IP address allows one PC to communicate with another PC via the internet. In the same sense that someone needs your mailing address to send you a letter, A remote computer needs your IP address to communicate with your PC, in the same way, a mailing address is needed if someone wants to send a package to your home. Internal/Private IP address is a unique address for your PC. It is the location of your PC on your network while an external/Public IP address is the address assigned to your PC by the internet service provider using which you communicate with all the devices on the internet. Private IP Address is unique and can be seen by the devices on your local network whereas Public IP addresses are not unique, they change from time to time. Learn how to hide your IP address using proxies and VPN. There are many ways you can find your Windows PCs IP address. 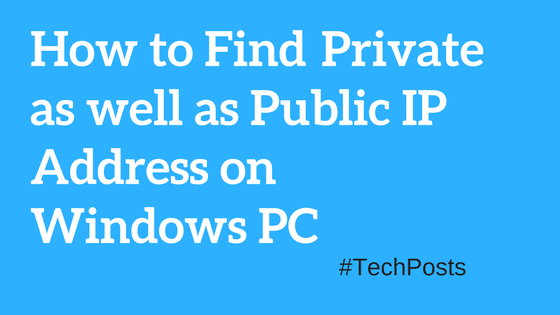 In this tutorial, I will mention some easy ways using which you can find your Private as well as Public IP Address. Let’s get started. Press Win+R from the keyboard and type cmd in the search box. It will open the command prompt. Type “ipconfig” and hit enter. This will show a list of your Windows IP configuration information. Find your connection (either Wireless LAN connection or Local area connection) and locate IPV4 Address. Your IP address is written in front of IPV Address. For Windows 8.1 or latest, select start button, type control panel and hit enter. Click Network and Sharing center >> Select your active connection and click on details. A new dialog box will open. You can locate your IP Address written at IPV4 Address column. On Windows 7, select start menu >> Select Control Panel >> open Network connections. Type Adapter in the search box, Open View Network connection under Network and Sharing Center. Now double click on your active network connection, and click details, your IP address is shown next to IPV4 address. Type IP address in the search bar and hit enter. Your Public IP address will be shown at the top of search results. Method 2:Find Public IP Address under your Router’s configuration page. You can also find your public ip address from your router’s configuration page. Login to your router configuration setting and locate your IP address under your router status. In your router’s administration page, you can find your public IP address and other information. That’s it from this article. All the above-mentioned methods are some of the easiest ways to find IP Address on your Windows PC. If you know of other methods, please share them in the comment section below.